One year ago, we posted on the LarkC blog a first network model of the LOD cloud. 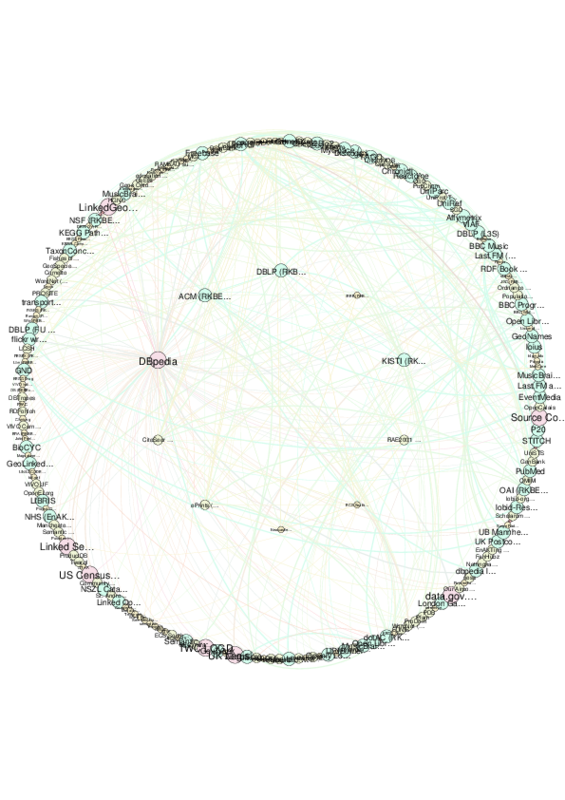 Network analysis software can highlight some aspects of the cloud that are not directly visible otherwise. In particular, the presence of dense sub-groups and several hubs – whereas in the classical picture, DBPedia is easily perceived as being the only hub. The script is hosted on GitHub. It produces a “.net” file according to the format of Pajek and two CSV files, one for the nodes and one for the edges. These CSV can then easily be imported into Gephi, for instance, or any other software of your choice. We also made a dump of the cloud as of today and packaged the resulting files.